After submitting a detailed analysis of the impact of the United Lincolnshire Hospitals Trust (ULHT) decision to close Grantham Hospital A&E at night, SOS Grantham Hospital (SOSGH) to Lincolnshire County Council (LCC) Health Scrutiny Committee, SOSGH campaign group chair Councillor Charmaine Morgan was invited to the Healthwatch Lincolnshire Meeting with members of the Lincolnshire Healthwatch Board on 12th January 2017. Healthwatch Lincolnshire was created in 2013 to independently monitor healthcare providers after a number of serious incidents across the country. They cover a wide range of services including GPs, hospitals, pharmacies and care homes. 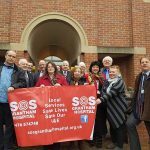 Councillor Morgan said: Since the closure of Grantham Hospital A&E ULHT have used a number of arguments to justify their position. I explained how SOSGH felt it vital the Trust follow the NHS principals providing care to everyone based on need. By centralising key services they have acted like a business. Not a healthcare provider. This has left 120,000 people in Grantham area without A&E services at night. Like us, the people in Skegness area also face exceptional journeys to A&E. Unless more government funding is found and if the STP is implemented, the situation will only get worse across our county. Given our county’s size, poor transport and rural roads it is vital to retain all our A&Es. Grantham is used to back up other hospitals in the area too. That is why all county councillors voted against our A&E night closure and against the Sustainability and Transformation Plans (STP). 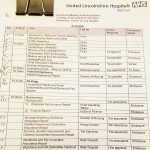 Staffing levels and ULHT’s recruitment issues were also discussed. 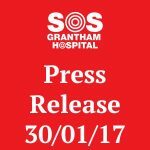 On a positive note ULHT have told both SOSGH & Lincolnshire Healthwatch they plan to reopen Grantham A&E as soon as possible, and certainly when staffing levels have improved. Councillor Morgan said: ULHT went into crisis after losing staff at Lincoln last summer. They have managed on low numbers for years as a recent report shows. Therefore it is the view of SOSGH, once ULHT have replaced these staff the Grantham A&E should reopen. Healthwatch Lincolnshire relies on local hubs for information. In future SOSGH will be operating as a hub for Healthwatch Lincolnshire. 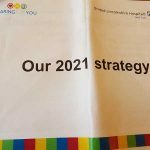 SOSGH will be submitting an impact analysis of the proposed STP to ULHT prior to their design meeting on 25 January. Cllr Morgan said: I had requested an opportunity to attend this LHAC meeting but was advised it is in-house. However, it is good practice when designing a new process to be aware of all potential issues as early as possible. They may influence the overall design. An SOSGH questionnaire will go out to User Groups to gauge their views on the current STP proposals. Feedback will be included in our Impact Analysis. I am delighted Healthwatch Lincolnshire will assist with this work. Anyone with concerns regarding healthcare services in Lincolnshire may contact Healthwatch Lincolnshire on 01205 820892 or email info@healthwatchlincolnshire.co.uk.